Crappie Anglers of Texas (CAT) was established on November 5, 2007 and is a non-profit organization created for experienced and novice crappie fishermen alike. CAT is structured to help novice crappie fisherman learn more about crappie fishing, while at the same time providing an opportunity to elite crappie fishermen to fish in tournaments against some of the best crappie fishermen in the south. CAT hosts meetings, seminars, fish frys and other events where anglers of all skill levels can share tips, techniques and fishing reports. CAT’s goal is to help educate crappie fishermen of all skill levels, provide enjoyable competition in tournaments designed to match the skill level of the individual fisherman, and to generally promote the sport of crappie fishing. There is no better way to get to know your fellow crappie fishermen than by joining the Crappie Anglers of Texas! 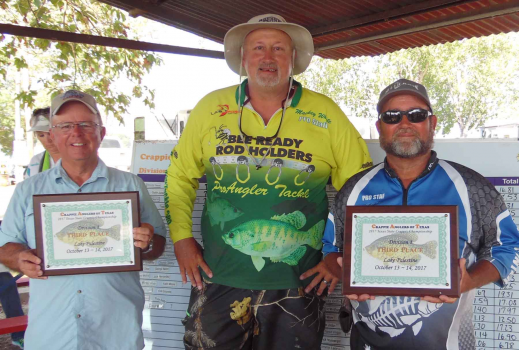 In Division 1, Paul O'Bier (Gunter, TX) and George Nelon (Boyd, TX) won first place with their two day total weighing 21.93 pounds. This was Mr. O’Bier’s 6th State Championship victory! Second place in Division 1 was won by Clay Gann (Hideaway, TX) and Todd and Langdon Froebe (Lindale, TX) with stringers from both days weighing a total of 21.84 pounds. 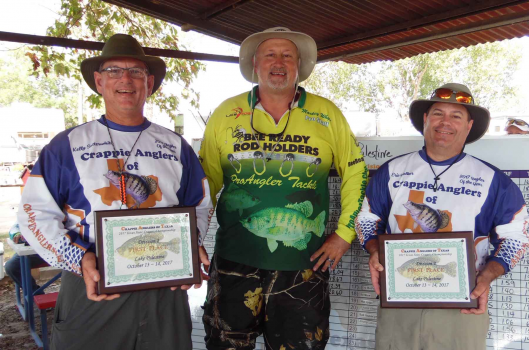 Ken Gaby (Belton, TX) and Todd Box (Alba, TX) took home third place with a two day total weight of 20.96 pounds. 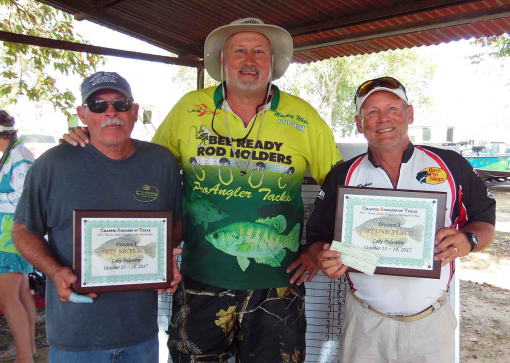 Tommy Ezell (Rockwall, TX) and Richard James (Wylie, TX) took home fourth place with his two day total weight of 20.76. Fifth Place was won by AJ & Carolyn Matura (Chandler, TX) with a weight of 20.60. 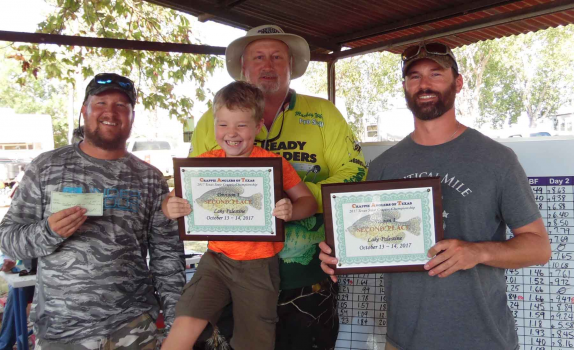 Jeff Schwieterman (Parker, TX) and James Rains (E. Tawakoni, TX) netted sixth place with their two day total weighing 20.27 pounds. Seventh place was won by Cody Standerfer (Prosper, TX) and David Gibby (Gunter, TX) weighing in 20.15 pounds. Chris Scott (Sanger, TX) and Willie Scott (Denton, TX) caught 19.72 pounds in two days and took home eighth place. Ahn Nguyen (Roanoke, TX) and Larry Kirkland (Rhome, TX) weighed in 18.82 pounds and claimed ninth place. Rounding out the top ten places in Division 1 with a weight of 18.67 was Kirk Grounds (Sachse, TX) and Kyron Washington. In Division 2, the team of Eric Walker (Teague, TX) and Kelly Satterwhite (Teague, TX) claimed the championship with their two day total of a whopping 21.13 pounds. Second place was claimed by Stuart Angelle (Flower Mound, TX) and Max Dukes (Murphy, TX) with a two day total weighing 19.31 pounds. Scott and Joby Bradshaw (Weatherford, TX) netted third place with a two day total weight of 18.73 pounds. Brandon Miles (Bullard, TX) and Martin Klein finished fourth with a two day total of 18.53 pounds. Truston Hibdon (Randolph, TX) and Ricky Griffin (Trenton, TX) netted fifth place with their two day total of 17.97 pounds. Alec Dyer (Keller, TX) and Bill Mouw (Burleson, TX) claimed sixth place with a weight of 17.23 pounds. 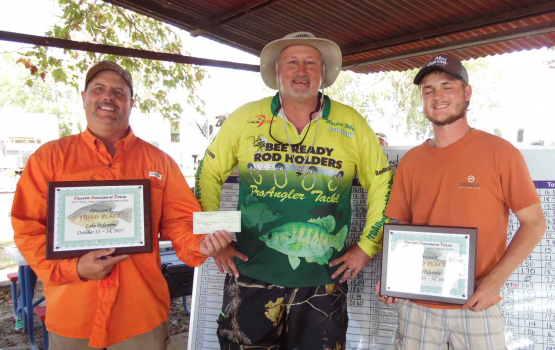 Seventh place was won by Donny Holder (Plano, TX) and Charles House (Allen, TX) with a two day total of 17.08 pounds. Max Jordan (Belton, TX) and Melvin Chupik (Belton, TX) netted eighth place with 16.90 pounds for their two day total. Kevin Tidwell and Casey Jeffrey won ninth place with a total of 16.82 pounds. Finishing out the top ten in Division 2 with a two day total of 18.61 pounds was Miles and Hunter McClain (Mansfield, TX). CAT topped off the weekend with its annual awards banquet, which was held at the Lake Palestine Resort Banquet Hall October 13, 2016. 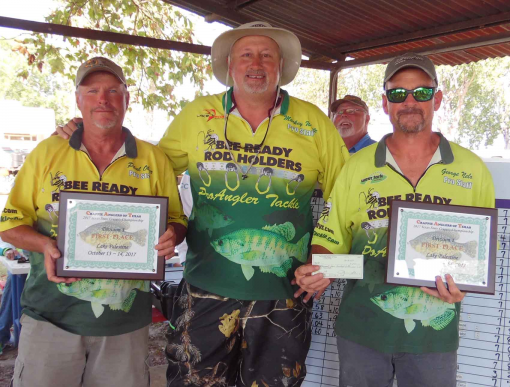 The team of Paul O’Bier/George Nelon won the “Anglers of the Year” honor in Division 1, and the team of Eric Walker/Kelly Satterwhite were named “Anglers of the Year” in Division 2. The prestigious 2017 Ron Conatser Sportsman of the Year award was presented to Eric and Rose Windham, and the 2017 “Top CAT” Award was presented to Jay Don Reeve. Crappie Anglers of Texas would like to extend special thanks to Lake Palestine Resort and the Coffee City Economic Development Corporation. Crappie Anglers of Texas is a non-profit organization dedicated to the sport of crappie fishing. With over 280 members nationwide, CAT has been instrumental in gaining national attention for crappie fishing in Texas and continues to develop its member’s knowledge of crappie fishing through educational meetings, seminars and fishing tournaments. All CAT tournaments pay back at least 100% of the anglers’ entry fees. For Information, go to the CAT website (www.crappieanglersoftexas.com) or contact: Jay Don Reeve at jay@reeveaugustine.com.